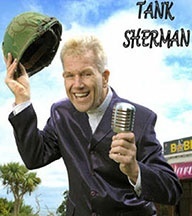 TANK SHERMAN the great comedian, hailing from the West Country. His love of performing has made him a very popular choice with Holiday Centres, Cruise ships, Hotels and corporate events here in the UK and abroad, Laughter is his job and he does his job so well. Tank tailors his material to suit any audience or event. And one thing that sets him apart from the rest is that you will never hear him use any dreaded 4 letter words on stage, he says you don't have to swear to be funny! Tank loves to blend classic main stream humour with his alternative madcap west country stories and poetry. TANK AIMS to make your night a special one so if you only book one comedian this year, make sure that it is TANK SHERMAN ....half the man .... double the laughter !